Relaxation. It's a beautiful thing. We get up in the morning, DH makes coffee and downloads the NY Times on his laptop, we eat breakfast and then he's off to work at his company's Adelaide office. I then have another cup of coffee and read the Times myself, and then check e-mails for an hour or so. Some are for work but I also correspond with my friends back in New Jersey, where it is late in the afternoon. Then it's time to get ready for the beach. Put on bathing suit, apply sun screen, add capri pants and a T-shirt, gather up a couple of books, a banana and yogurt ("European" style - plain with no sugar) and a bottled water, leave the room, stop to pluck a couple of towels from the hotel gymnasium and stuff them serreptitiously in my bag, and then it's on to the train station just across the street. I then buy my ticket to Seacliff (I tried Brighton Beach the first day but it didn't have a public rest room and I felt funny using the one at the "hotel" (that's Australian for pub, mate) at the beach. Seacliff is a lovely little beach community a 20-minute commuter train ride away. I take the express train that leaves every half hour. The train platform is only a short walk from the beach, so I arrive on the beach less than a half hour after boarding the train. I feel proud I have managed to master the art of buying the ticket, getting on the train and validating it in the little machine, and then buying another ticket on the train on the way back. Buying it on the way back is done on the honor system, but of course you can't leave the train station in Adelaide without putting the ticket into the turnstile, so they do check on you. Wednesday at Brighton Beach, it was rather cool - a southerly breeze was blowing strongly in over the ocean. It's strange to remember that here, a southerly breeze is cold - it's coming from the direction of Antarctica - while a north wind is hot, like the Santa Ana wind, as it blows in off the desert. That first day I only lay on the beach and enjoyed the breeze and the scene of azure water framed by white sand and picturesque houses; it was a little too breezy to make me want to go in the water. I am continually amazed at the beaches here. No crowds - at most I see 10 other people the whole time I'm there. No tacky t-shirt shops, stores selling fried dough, hawkers inviting kids to try their hand at winning a stuffed animal. No boardwalk, no rides. 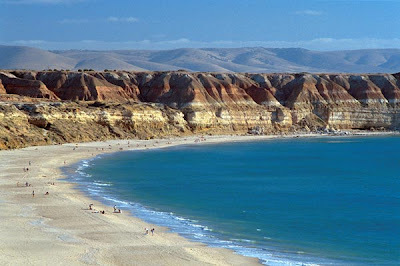 More like Cape Cod than the Jersey Shore, but in the end, nothing like anything but itself, the South Australia coast. My first day at Seacliff, the weather started out the same as the day before - a stiff breeze coming in off the ocean, deep blue sky, azure ocean. After I had eaten my yogurt and banana, I got hungry again later and decided to go to the takeout fish 'n chips restaurant that is next to the Seacliff Hotel, where DH and I had dinner last weekend. These two establishments are the only source of nourishment near the beach. I bought myself a box full of chips and fried fish, dripping with grease and hotter than the sun that was suddenly beating down on me. The wind had changed and was off the land. I sat on my towel and enjoyed my feast. Then I decided to take a dip. The water is not warm here, although it is certainly more temperate than the ocean at Nauset Beach in Eastham, where the water is so cold that immersing your feet in it for more than a minute will make your toes go numb and a dull ache creep up your calves. On the way back I trudged up the hill to the train platform. There was one other person there, an older gentleman. Being a typical American, I planned to avoid conversation and sat down momentarily on a bench far away from him. Suddenly my feet were covered with tiny ants! Biting tiny ants! I jumped up, squawking, and stamping my feet about. Naturally after that performance I felt I should make some conversation. We ended up chatting the whole way back to Adelaide. He was born in Italy, but had lived here all his life. Like many Australians, he had traveled far and wide, visited America and seen a cousin in Syracuse he hadn't seen for 40 years, went to New York and Europe, including, of course, his native Italy. And Asia too. He lived in Seacliff, in a mobile home, had just retired, and was on his way to visit his aged parents, mother 95 and father 97, who were in a nursing home in Adelaide. At the end of the ride we parted ways good friends, with a handshake and a "it was great meeting you." Today was another hot day at Seacliff, worthy of two dips in the ocean. The day was hazier and the ocean had that kind of greyish vague look that it gets when there is mist on the horizon. Sea gulls stalked me as I ate my banana and yogurt (no fish and chips today, I have to draw the line on the number of calories I consume). Unafraid, they stood not far away and stared at me with their little yellow eyes. I apologized for not having anything for them to eat and they moved on. As I was standing on the platform waiting for the train back to Adelaide, the magpies were screeching and doves were cooing somewhere. The smell of pine trees and more tropical vegetation permeated the air and a group of women on a nearby bench chattered melodiously in the background. The bushes near the train platform were festooned with brightly colored flowers, and aside from an occasional passing car, there was silence. It was all so peaceful, it was hard to imagine that New Jersey is waiting for me with its cold, its ice, its...employment. Yes, I do have to go back, I know that, but couldn't I just commute from here as I've been doing? Last night we went out to DH's favorite pub, The Exeter, and met three of his "mates" from his office. Two young ones not long out of school and a somewhat older man (in his 40's, still younger than we are). We were attending "curry night" at the Exeter. The deal is, they serve 5 different types of curry, there's one seating from 6:30 to 9:00, and booking was essential, as it fills up early. 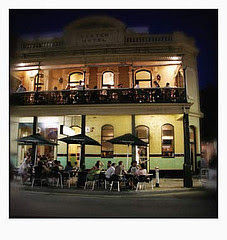 We were seated upstairs on the balcony overlooking Rundle Street, the breeze was blowing gently, and it was another great experience. The curries were excellent - we ordered all 5 varieties (a beef vindaloo, a chicken with peanut sauce, a vegetable curry, a Malaysian seafood curry and a lamb curry). Much Coopers ale was consumed by all the men, as I nursed a ginger ale and drank copious amounts of water. One of the young guys told a funny story; about a year ago his hair had gotten long and he went to a hairdresser and asked if she could do something interesting with it. Her eyes lit up and she suggested a Mohawk. He looked a bit concerned and said he didn't know if work would appreciate that, so she asked him what he did for a living. He said "I'm an engineer." "And," he said, "that's how I got this haircut," pointing to his conservatively cut shortish hair. Apparently that was the engineer haircut. The older member of the group, who was a kind of Steve Irwin type if Steve Irwin had been an engineer, regaled us with tales of his encounters with wildlife, such as the time he pulled the tail of a large lizard just as it had gone into its hole - he was surprised to find out the lizard was able to turn around quite smartly and come right back at him. Another time he was camping and was awakened in the middle of the night by nocturnal penguins that were chirupping outside the tent. "They really don't like being picked up though," he commented, adding that they have "really sharp little beaks and claws." Would you pick up a penguin if you saw one? No? Didn't think so! Neither would I! After yet more rounds of Coopers Ale, we finally took our leave, after sitting there for nearly 3 hours. DH and I wended our way home, stopping for gelato and cappuccino at a cafe on Rundle Mall. Rundle Mall isn't a mall in the usual sense of the word in New Jersey. It is a pedestrian shopping street with stores all along both sides, some of which do lead into what we would think of as a "mall." 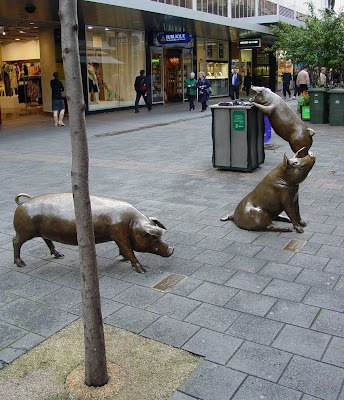 But it has cafes in the middle and even a sculpture of three bronze pigs! Adelaide is really an exceptional town - it is big enough to be a city, yet small enough to be cozy; it has a vast range of restaurants, from Asian to Italian and everything in between. It has broad streets lined with interesting buildings, including many that date from the mid 1800's, as heritage is important here. And best of all, the entire city is surrounded, and permeated by, parkland, as it was a planned city and greenery was important to Colonel William Light, who planned it all out in the early 1800's. 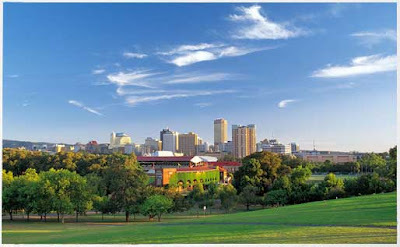 As a result, it is a very liveable city, and reminds me in a way of Portland, Oregon. I could SO live here! I can never think of the words "The Land Down Under" without thinking of Men at Work's song...here's a great little YouTube version of it with some interesting factoids superimposed on the video. Enjoy! Well, in case you hadn't figured it out, I made it. Despite snow, sleet and freezing rain, I made it to the airport (thanks to a good friend who volunteered to drive me there). The plane actually took off only an hour late (thank you American Airlines) and arrived only 45 minutes late to LA. This gave me plenty of time to make it to my Qantas connection in the international terminal next door. I read 1-1/2 books on this flight and ate a not very good meal. Qantas was awesome - lots of legroom and I was lucky enough to be in an aisle seat in the middle section of a 747 with only one other person, on the opposite aisle seat. Plenty of room to spread out. - Ate a very good meal of chicken and rice, Spanish style. - Watched a movie ("A Good Year," with Russell Crowe, about a London stockbroker in Provence. I now want to move to Provence). The flight to Adelaide was enjoyable - the pilot was the kind of pilot that likes to make amusing and literate remarks while you are traveling. With the Australian accent it was even better. And, they even served "mid morning tea" as part of the one-hour flight. Not like in the U.S.! DH was waiting for me with a big smile and whisked me off to the hotel, which is in a great location and consists of a two-room suite and a kitchenette. Our computers hook up nicely to their ethernet cord and it's a great little home away from home. The weather here is HOT. They call it 40 degrees but we call it 105! But it's a dry heat, and not all that unbearable. We took a walk on the beach right outside of Adelaide at 8 a.m. the first morning after I arrived, and then toured the Fleurieu Peninsula, which has great beaches and lovely wine country. Follow the map for our route. We left Adelaide, went south along the coast, turned inland at McClaren Vale, drove down to Victor Harbor, over to Goolwa, and back up to Adelaide. This is Maslin Beach, one of the beaches we stopped at. The weather here has been very dry and the land all has that kind of parched, bleached look that drought-ridden areas get. But the vines all look healthy in the vineyards and the eucalyptus is doing just fine. The streets of towns were relatively deserted, as the native Aussies apparently don't go out when it's 105 degrees. However, "mad dogs and Englishmen...and apparently crazy Americans...go out in the midday sun!" as the old song goes. Yesterday we drove north to explore the Clare Valley, another area rife with vineyards. We stopped in an antique store in a town called Auburn and had a long conversation with the owner, who recommended we tour a nearby stately home. It was definitely worth the visit and we were glad to have had the recommendation. News flash: Diva has "dodged a bullet"
Since I am checking e-mail, I was able to receive an e-mail from the veterinary surgeon who took off Diva's little bump. It turned out that the bump was indeed a mast cell tumor, despite its very unthreatening appearance. Our regular vet was right to be concerned about it, and it turned out I was right to take the more aggressive approach and just have it removed completely. The vet said that the excision was complete and the surgery was curative. It was a Grade 1 tumor (which is a less aggressive type) and was of course very early since she only had it a couple of weeks. It's good to know we did the right thing! Diva is a lucky girl! Miss D is doing fine! I knew I shouldn't have whined so much. Everything turned out OK. I took Diva bright and early Monday morning and the vet that was going to take off the growth looked at it and said it looks like nothing, to him. Maybe a wart. But since I was going away and you never know for sure if something is a mast cell tumor as they can look like anything, I decided to go ahead and have it removed. Then I was wracked with guilt that I was putting the poor baby through all this just for my own peace of mind when it was probably nothing. My mind was racing a mile a minute, thinking "What if something happens to her and she didn't even need to have this done?" Luckily at about 11:15 a.m. the vet called to tell me she was fine, was in recovery and waking up. I was able to go pick her up after work and take her home. She has a big shaved place with a scar and stitches in the middle of it. She looks like a football. You know those stitched lines on the football? That's what my dog looks like. Before I took her home, the vet and the technician informed me that Diva had chewed off not one, but TWO Fentanyl patches from her ankle. She was supposed to have this patch on her ankle for 5 days to relieve pain. Since she insisted on eating them, they said she couldn't have one after all. I was just as glad, because it would have meant she had to wear one of those awful Elizabethan collars, and it would have been so uncomfortable. Plus I'm not convinced the Fentanyl is such a great idea; it makes them groggy and weird. So I brought her home and she went and lay down on her bed right away. She whined a little, which made me feel bad, until I realized she was complaining, not telling me she was in pain. What she wanted was Dog Dinner. I gave her her dinner and she gobbled it down and then rested for the rest of the night in apparent comfort. I decided to work at home in the morning and then take her to the vet's for boarding on my way to work since I'm supposed to be going to Australia tomorrow. Before doing that I took her for a walk. Well, this dog was not being deterred from having the long walk that she felt was what she deserved to have. We usually use a special harness that prevents her from pulling. Well, because of the scar, I had to use an ordinary harness since it would hit her in a different place and not touch the scar. When Diva wears an ordinary harness she immediately thinks she is a Sled Dog and pulls for all she's worth. The other thing she does is put the brakes on. If she doesn't want to go where you want her to go and she's not wearing her special "Gentle Leader" harness, fuhgeddaboutit. She put the brakes on when I tried to get her to go home. She put the brakes on when I tried to turn in a different direction than she wanted to go. She particularly put the brakes on when she got into a snarlfest with another dog through a fence and wanted to stay and continue the conversation. When I finally got home, I suddenly noticed blood on the floor! Turns out she had put the brakes on so thoroughly that she had scraped her back toenails and broken some of them! So here I was, supposed to be taking her to the vet's for boarding, and feeling bad enough that I was deserting her with her newly-acquired scar on her shoulder. Now I had to bring her in with bleeding feet! I felt like a Bad Dog Mother. Naturally as I was trying to blot up the blood she was running around as if nothing was wrong and making sure to step thoroughly on all of the rugs in the house. I finally managed to get her to the vet's and get her settled there with all her special food and other equipment. I then headed to work where I put in another 4 hours of work before leaving, finally, and meeting a friend for dinner! About two weeks ago DH was hugging Diva and felt a tiny bump on her side. We immediately called the vet but they couldn't take her until this past Friday. By the time I got her in there, the bump seemed a little larger and harder. 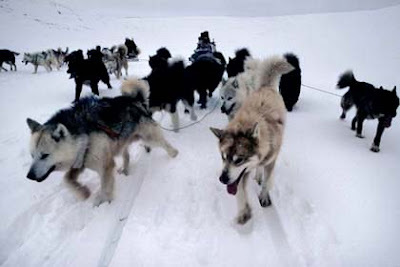 I knew it could be something serious such as a mast cell tumor, which are common in dogs, and are usually malignant. Alice had had a bump on her muzzle that we had removed, and at that time I had done a lot of research on the Internet about tumors in dogs, so I knew it could be something bad. In Alice's case, it was benign, luckily. Despite knowing it could be something bad, I went in to the vet's office with the expectation that she would say "Oh, it's just a little cyst, we'll do a needle aspiration and make sure." Instead, she looked at me seriously and said she "didn't like the way it looks." Immediately freaking out, of course I wanted it removed immediately. She couldn't do it until next week, but at my suggestion she said she would call the surgeons at the Emergency & Referral veterinary clinic down the street, and see if they could remove it sooner. In the meantime, she took x-rays and did bloodwork for an hour and I went off shopping for groceries to kill the time. I was walking around in disbelief; how could something bad happen to my dog? After what happened to Alice? I felt like crying in the middle of the supermarket. However, I managed not to. When I returned to get Diva and hear how the x-rays looked, the vet told me everything looked pretty normal to her so that was good news. She also said they could take Diva on Monday at the other vet's. So Diva has an appointment for tomorrow morning to be put under anesthesia and have this thing taken off her side; if it is a mast cell tumor she will have a pretty good chunk taken off around it. Now, here's the strange part. Since she went to the vet's on Friday the bump has gotten smaller. A lot smaller. Is it like when your car makes a funny noise and you take it to the mechanic and it stops making the noise? 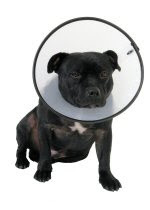 I can just see going there and having the vet look at it and ask why I'm bothering him about this little thing? Of course, mast cell tumors apparently can change erratically in size since they are inflammatory tumors. So I'm not counting on it being nothing just because it is smaller. But I do have hope now that it is very early and therefore curable. Of course now I hear it's supposed to snow on Wednesday. All winter there has been no snow to speak of, and of course on the day I'm supposed to fly, it's now going to snow. It's always something. However, I have a better motto than that - my mantra is, "It is what it is." Whatever happens, don't look back, just look forward and deal with it. So that's what I'm going to do. And I'm going to stop whining now. Oh, speaking of illnesses...new post on Medicana. Check out Myasthenia Gravis! Last night a group of us went out and in the course of our conversation, the subject of White Castle hamburgers came up. This never fails to elicit from me a description of the White Castle that used to be in Verona, New Jersey, on the corner of Bloomfield and Pompton Avenues. In fact, I tend to wax poetic in describing my memories of the place. The Verona White Castle is intertwined with all those memories of late night adventuring that I did when I was young. Hard as it may be to believe, Mauigirl once went out partying until the bars closed. And what is more perfectly delicious and nourishing at 2 a.m., after imbibing an inordinate amount of alcoholic beverages, than to partake in that great American repast, White Castle cheeseburgers, or as they are affectionately known as, "slyders"? Our White Castle was tiny, with one or two little tables placed in the area where you first walked in. At 2 a.m., this area was full of other inebriates waiting for their hot, fragrant bags of burgers. I would wait patiently behind them in anticipation of the moment when I could actually get up to the window to see the burgers being made. When you gave your order you were given a number and when that number was called your order was ready. But in between that time was the delicious anticipation of the arrival of the order. You could stand staring into the window at the griddle where the little square hamburgers with the holes in them were cooking away. There is something about having been drinking that always focused my concentration. I would stare hungrily through the window and take in each detail of the scene, including the faces of the preparers. At our White Castle, two people always manned the griddle at 2 a.m. One was a very old man, probably at least 80 years of age, with no hair whatsoever and one of those white paper caps that people wore in fast food places in those days. The other was a middle-aged woman with brown straight hair pulled tightly up into a round bun on top of her head. No paper hat was needed, as her severe hairdo took care of any stray hairs that might have slipped into the burgers. She had a round pudgy face and the brightest blue eye shadow I'd ever seen. I would watch as they took out new frozen squares of hamburger meat, placed them onto the bed of chopped onions that had been cooking there probably since 1921 when White Castle first opened. Gradually the hamburgers steamed over the onions and cooked themselves. As they turned from pink to brown, pieces of cheese were placed on the ones destined to be cheeseburgers; the little buns were placed on top so that they got steamed along with the hamburgers, and the whole entity became infused with the cooked onions. Finally the time would come; burgers were scooped up, put together, and put into those white paper bags labeled "White Castle," along with the orders of fries and onion rings. Then, miracle of miracles, your number was called, and you exited the White Castle with your bag of treasure, got into your car, and drove off, devouring the fries with one hand until you got to your destination and feasted on the rest. The last time I had White Castle was with my husband the year before we got married. It must have been 1984. We had been out and got the craving...went to White Castle (I'm sure the old man and the woman with the blue eye shadow were still there) and brought home a dozen "slyders" and fries. We ate the whole thing and as usual got up the next day feeling that slightly queasy feeling you get after eating White Castle. It's those onions that have been cooking for 75 years that does it. Alas, our White Castle is gone now; replaced by a Famous Ray's of New York pizza place and an Acura dealership. 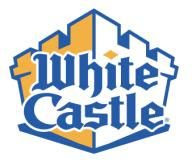 There is another White Castle over in Orange but it's much bigger than "our" White Castle and I've never been there. Anyway, the old man and the woman with the blue eye shadow wouldn't be there so it just wouldn't be the same. I'll just hold on to my memories. If you or someone you know has high blood pressure, you may want to check out my latest post on Medicana (http://www.medicana.blogspot.com).